Vancouver, BC, Canada / TheNewswire / August 21, 2018 – Equitorial Exploration Corp. (TSX-V: EXX, Frankfurt: EE1, OTCQB: EQTXF) (“Equitorial” or “Company”) is excited to announce the drill assay results from drill hole CT-18-03 and CT-18-05 that have been recently received from the Cat Tail Pegmatite in the Cat Lake area of southeast Manitoba. The drill holes are from a program carried out by the company in late spring of 2018. 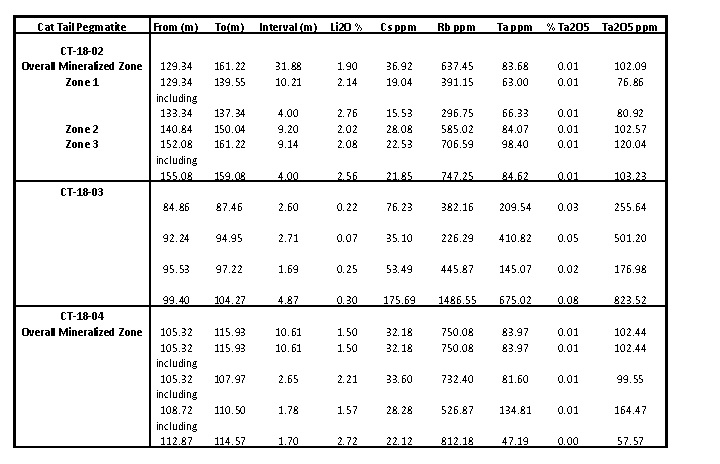 The lithium content of this portion of the Cat Tail Pegmatite system was not as lithium enriched as previous drilled sections (0.07 to 0.30% Li2O) but returned significant tantalum mineralization with individual assays up to 0.16 % Ta2O5 (see Table 1 for weighted averages of the pegmatites intervals in CT-18-03). According to the 2011 USGS (United States Geological Survey) report on Niobium and Tantalum (see link here), in 2011, tantalum ore grade deposits mined in the world were less than 0.05% Ta2O5 in Australia, Brazil, Canada, Ethiopia, and Mozambique. It indicates that the newly discovered tantalum values at the Cat Tail Pegmatite are comparable to mining grades at known tantalum deposits. Further exploration is warranted with regard to the lithium and tantalum potential of the Cat Tail Pegmatite. The assay results from drill hole CT-18-03 strongly suggest that the Cat Tail Pegmatite system has potential for both high grade lithium and tantalum mineralization zones. Cross section work for the drill hole suggests that the intervals of host rock between the pegmatites encountered in this hole may be rafts of country rock. Further drilling has been planned to examine this section of the Cat Tail Pegmatite in more detail. Drill hole CT-18-05 was collared approximately 110 meters to the east of discovery hole CT-18-02. It is suggested that this drill hole over shot the main pegmatite but still encountered a pegmatite swarm but with a low lithium content and not mineralized in other elements (see table 2). A total of 1,256 meters was completed in the Phase 1, 7 drill hole program with six drill holes testing for the pegmatite potential of the property and the seventh hole testing a sulphide rich skarn. Numerous pegmatites were encountered in all the holes with a main spodumene bearing pegmatite (Cat tail Pegmatite) encountered in four of the six drill holes. Prior to being drilled, this pegmatite was buried with no surface expression. Hole CT-18-03 appears to represent a high grade tantalum zone of the lithium rich Cat Tail Pegmatite. Assays are pending for the last two holes. Table 3 is an overview of the drill holes that encountered the Cat Tail Pegmatite. Table 3: Cat Tail Pegmatite Intersections. 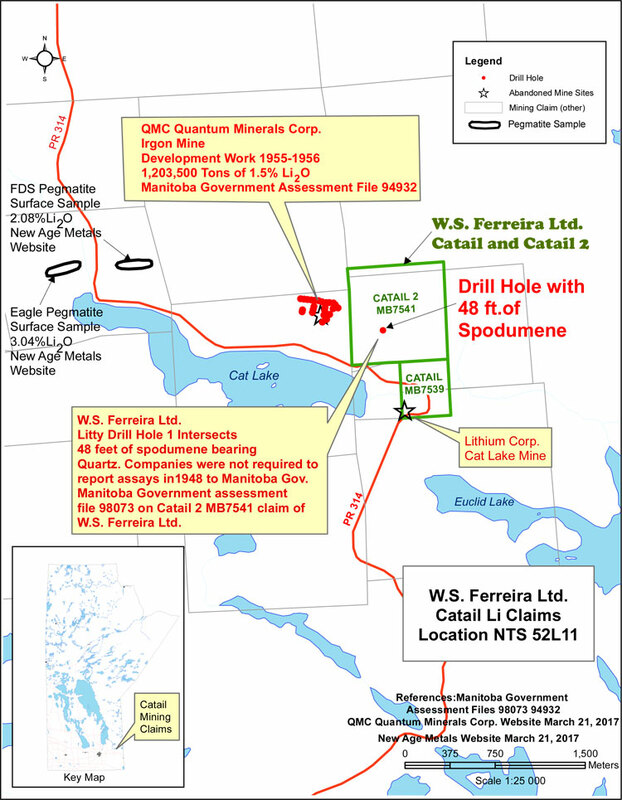 The company has applied for a drill work permit with the Province of Manitoba and is awaiting approval. The drill program has been designed to further drill test the Cat Tail Pegmatite along strike and at depth. A fall field exploration program of mapping and bio-geochemical sampling has also been planned. The field work will aid in a better understanding of the Cat Tail Pegmatite system as the discovery hole was a blind target. The drill program was supervised Carey Galeschuk. P. Geo, a consulting geologist with extensive experience in rare metal and lithium-bearing pegmatites. He also serves as Qualified Person for the purpose of National Instrument 43-101.